I came home from Bluesfest last night (well actually, only a few hours ago) too excited to go to bed straight away – another fabulous night of music and dancing, and feeling high on life. Ever since my wake-up call, I have never taken a single day for granted, and today has been one of those sublime sunshiny days and starlit evenings where I am grateful for every breath. The moon was high and full, and as our bus wound its way down our heavily wooded country lane I began to feel their energy. There is something magical and a little spooky about owls. And lately they have been gravitating to our farm in larger and larger numbers. One was waiting on the gatepost as we drove on by, our Murray Grey cows shining silver in the moonlight as they grazed the adjacent fields. One called to me as I alighted from the vehicle. As everyone else went inside I stood in the brisk night air, and communed with my nocturnal visitor a moment. 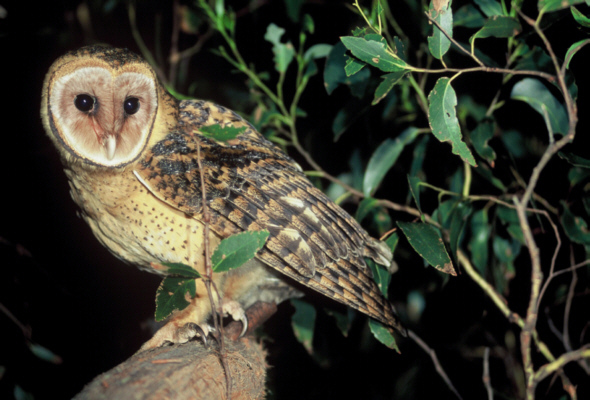 Another flew in and sat in the tree above me – two Masked Owls blinking lazily. One whisked past me, low to the ground, and alighted on the lawn. This one was a Powerful Owl – a huge and majestic specimen. I made a cup of tea and sat out on the verandah, feeling the mist off the ocean slowly settling in the valley around me and smudging all the stars into softer shapes in the sky. 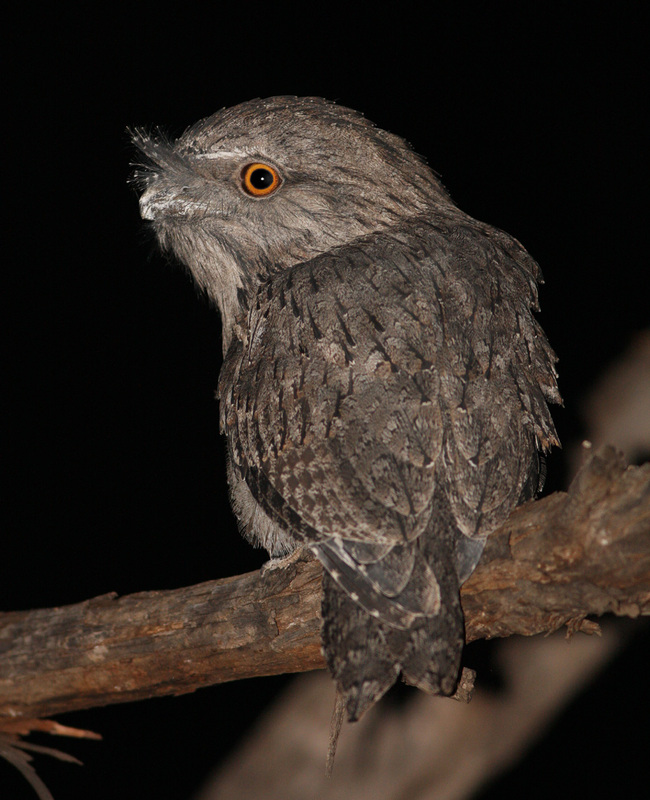 A Tawny Frogmoth came and sat on the clothesline and was soon joined by two more. I felt as if I were smack bang in the middle of a bizarre Potter-esque Owl Convention. This morning the Powerful Owl was still sitting in the teak tree at my front door. He watched me carefully as I did my morning qi gong and yoga stretches. It felt like he was waiting for me somehow. 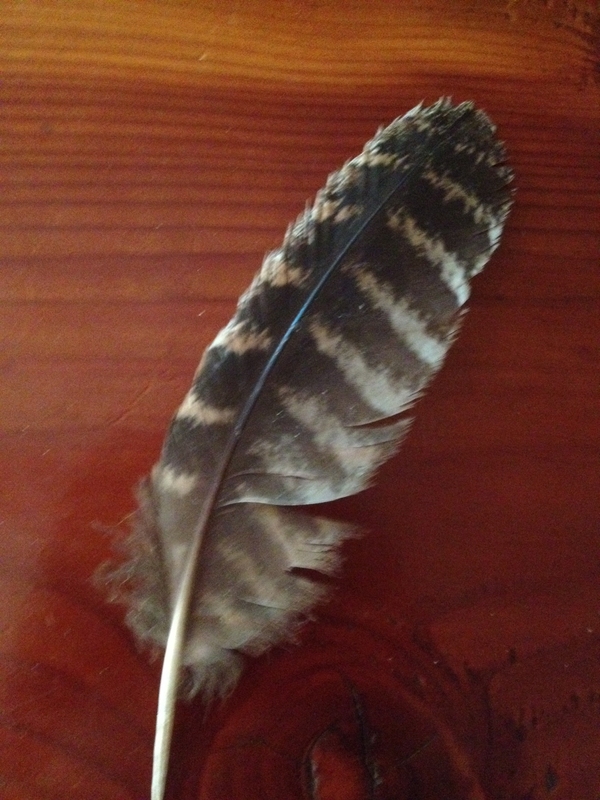 When I went to go back inside I found a feather at my feet – a little piece of owl magic. I’ll weave it into a Dream Catcher to hang above my bed. Then perhaps my dreams can tell me why the owls are here, and what messages they have for me. I sense great change, great opening, and it makes me wonder what will come next for me. I feel like I am being called, but to what? I trust all shall be revealed in time. This entry was posted in Life, Metaphysical Stuff, Psychic Development, Soul Growth, Spirituality and tagged Harry Potter, Masked Owl, nature, Nicole Cody, owl, owl meaning, owl spirit guide, owls, Powerful Owl, psychic development, psychic gifts, spiritual message, spiritual messenger, Tawny Frogmouth, yoga stretches by Cauldrons and Cupcakes. Bookmark the permalink. Your home sounds magical … and you have owls too … you are one very lucky person, not just one or two owls, but so many! I love to hear owls and occasionally I am fortunate enough to catch a glimpse of one in flight in the countryside where my sister lives. Beautiful creatures. I always feel a sense of calm when they are about. The Bluesfest sounded great too!!! I am lucky to have so many owls! I believe humans know when someone else has that wisdom within that may guide or help them in some way, so I think it’s wonderful you were called Tawny. A great talisman or Spirit Animal for you! All I can say is wow! And I felt lucky to have a pair of barn owls in our nest box! Wow right back! 😀 Nesting barn owls? Soon you’ll have owl babies!!! Yes! We put up a box about 4 years ago and have had a pair every year since. One year we actually witnessed the parents teaching their two young ones to fly, On hot days they sometimes sit on perches in the barn so we can get a good look at them. Absolutely beautiful birds. How wonderful. Hope you get some photos to share with us! Change is often unsettling so I’m enjoying the sunshine but won’t be dissappointed if there are a few dark clouds on the horizon. That’s just how life is. Wow. Hawks and eagles are an everyday occurrence here, but not owls. Enjoy your unique ability to call them to you! Hawks and Eagles have their own majesty, don’t you think? We have a huge Wedgetail Eagle who nests on the hill up beside my orchard. He fills me with awe. How lovely that you are finding feathers too! The Aurora Borealis is on my bucket list!!! Very mystical and magical. How lucky you are to have such an experience! Thanks for sharing. I love owls.. they are so cute! I love owls but I very rarely see them. What a treat you have in your garden with all those wonderful birds. A very nicely written post too, a bit magical and mysterious, you certainly captured the slight spookiness of your night time visitors. And as soon as I know what the owls intend for me I’ll be sure to let you know. Here’s to seeing you at Bluesfest where we can boogie the night away! Wow! That sounds like something out of a movie! What an incredible weekend it sounds like you are having! well while you’re communing with owls, i killed one of a breeding pair on the road under the full moon. it feels like i committed a crime! but it was an accident….i couldn’t stop my car in time…. xxxxx ~*~ xxxxx it does seem that way…..!!!!!! !…….life can be terrifyingly exciting like that! As night time hunters, owls are gifted with clear night vision. They can see what others miss, which aligns with the visionary work that you undertake in the realm of psychic readings. So, at one level, the appearance of all these owls is an affirmation of your great work. But owls also rely on deception in the hunt, so they bring a warning to be vigilant and discerning when they appear, as things aren’t necessarily as they seem. The appearance of the masked owls at night would seem to lend some weight to this warning, suggesting that something is yet to be revealed. 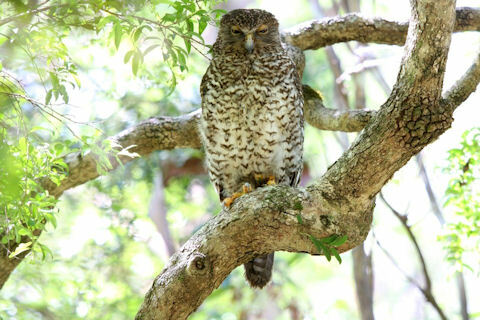 Your sense of great change and great opening is in alignment with the appearance of the Powerful Owl in broad daylight, suggesting that great and powerful developments are approaching and will soon be revealed. It seems to me that the message for you is to remain open and vigilant for the opportunities that arise, but also to be discerning. The eloquence and beauty of the way spirit talks to us through nature never ceases to amaze me. Wow, I’ve got this thing for owls, love anything owls, will watch anything owls… they are my favourite bird (and I’m not particularly fond of birds in general) and have always been intrigued by them. I love that they are special and +ve for you. It says to me…. my owl thing must be a good thing! !